Welcome to the online Citizens Union 2014 Primary Election Voters Directory! On Tuesday September 9th, 2014 registered voters in New York will head to the polls for the Primary Election. 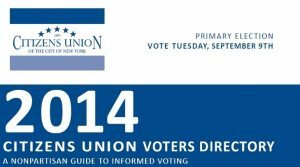 Citizens Union’s Voters Directory helps voters by providing a comprehensive overview of the 2014 party primary elections, including voting and registration information and listings of every contest for all races on the ballot. Citizens Union also evaluates candidates in certain races and issues preferences. This page contains information regarding each of the 15 races that were evaluated, accessed through the links for each district below, and indicates our preferred candidates in bold. Mail your Absentee Ballot Application or Letter of Application by Tuesday, September 2nd. Apply for an Absentee Ballot in Person at your local county board of elections office by Monday, September 8th. Mail in your Absentee Ballot with a postmark by Monday, September 8th – it also must be received by the local board of elections no later than September 16th. Drop off your Absentee Ballot by Tuesday, September 9th to your local board of elections office – a friend or relative can drop it off. The Primary Election will be held on Tuesday, September 9th.